There is an extreme level of energy and physicality expanded during rugby, which requires aerobic endurance of moderate intensity across a long duration. Playing rugby as a one-off can be managed with the right preparation, while regular players will need to keep a detailed log of their blood glucose trends. Taking frequent tests during training and matches will enable you to assess how your blood sugar can be managed on a regular basis. Chris Pannell, of Worcester Warriors, is a England international, having been diagnosed with type 1 diabetes aged 19. Other current players include Brett Stewart, an Australian fullback, while Alun Davies, who also has type 1 diabetes, spent 20 years playing rugby before becoming the Welsh Rugby Union's player welfare manager. Depending on your position, rugby can require that you have vast physical strength, which is developed through a starchy diet and frequent anaerobic exercise. This is certainly the case for forwards and, whilst less essential in backs, strength is still a desired quality. For those playing regularly, and therefore working out frequently while eating additional carbohydrates, further management will be required. Read the guide to going to the gym for more on how to manage diabetes when building your muscle mass. However, these are both dependent on the intensity of your planned session. If your blood sugar is within 6-9 mmol/l at lunchtime, an afternoon session may not require any insulin after consuming lunch or a smaller portion of carbohydrate. Sugar such as energy drinks, tablets or small snacks can help regulate your blood glucose levels during sessions, in which blood tests should be taken every 30-45 minutes. Match days will be quite similar to training in terms of the amount of insulin and food portions you absorb before the game begins. However, Exeter Chiefs fly-half Henry Slade explained in an interview with Diabetes.co.uk that adrenaline can be a factor necessary of consideration on match day. Blood tests before, during half time and after the match will enable you to assess trends of your blood sugar. If you test high, you will know for next time then you could consider injecting a reduced insulin dose before the game, while if low, sipping glucose drinks such as Lucozade during stoppages of play will initially be necessary. If this continues at any point of the game, you should lower the nightly or morning doses of your long lasting injections before match days going forward. If you are on insulin stimulating medications, such as sulphonylureas or glinides, you will either need to increase your carbohydrate intake or have a reduced dose of those medications. You should speak to your doctor before making any changes to your medication. Test your blood glucose levels regularly during and after training and games to monitor for any low blood glucose levels. You should remember to take special care of your feet when exercising. Your choice of rugby boots should be comfortable throughout a game and also strong to protect your feet from the studs of other players. Playing regular rugby will require consistent foot care. Rugby is an excessive contact game and wearing an insulin pump is not advised for this sport. Read more on exercising with an insulin pump. What do other people say about playing rugby? 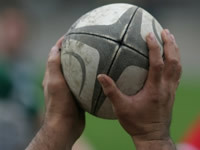 Members of the Diabetes Forum have previously discussed issues with diabetes when playing rugby. Community member tbcgaz, wrote: “I stumbled across the forum searching online about low carbohydrate diets and diabetes as I am a type 1 diabetic who plays rugby and I am looking to bulk up. A few of the guys at my club are on low carb, high protein diets and I wasn’t sure how this would affect me”. Exercise increasing blood glucose levels?